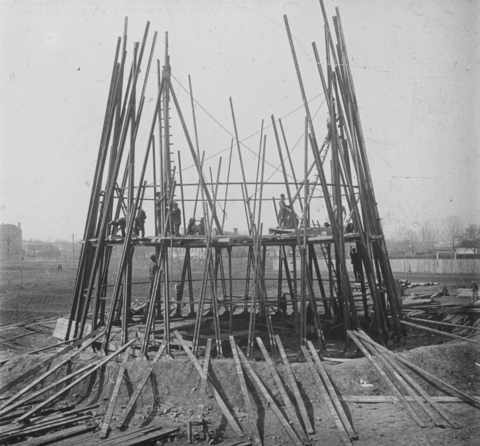 Under construction: The Shukov radio tower, Moscow, 1920-1922. The futurist poet Velimir Khlebnikov had no direct influence on Noam Chomsky. Yet there is an indirect link. During Russia's revolutionary years, Khlebnikov entranced and inspired Roman Jakobson, whose formalist linguistics in turn made a deep impression on Chomsky when the two became friends in the United States some decades later. For more on Russian formalist roots, see Decoding Chomsky, Chapters 10 and 11. The Radio of the Future—the central tree of our consciousness—will inaugurate new ways to cope with our endless undertakings and will unite all mankind. The main Radio station, that stronghold of steel, where clouds of wires cluster like strands of hair, will surely be protected by a sign with a skull and crossbones and the familiar word “Danger,” since the least disruption of Radio operations would produce a mental blackout over the entire country, a temporary loss of consciousness. Radio is becoming the spiritual sun of the country, a great wizard and sorcerer. Let us try to imagine Radio’s main station: in the air a spider’s web of lines, a storm cloud of lightning bolts, some subsiding, some flaring up anew, crisscrossing the buildings from one end to the other. A bright blue ball of spherical lightning hanging in midair, guy wires stretched out at a slant. From this point in Planet Earth, every day, like the flight of birds in springtime, a flock of news departs, news from the life of the spirit. In this stream of lightning birds the spirit will prevail over force, good council over threats. The activities of artists who work with the pen and brush, the discoveries of artists who work with ideas (Mechnikov, Einstein) will instantly transport mankind to unknown shores. 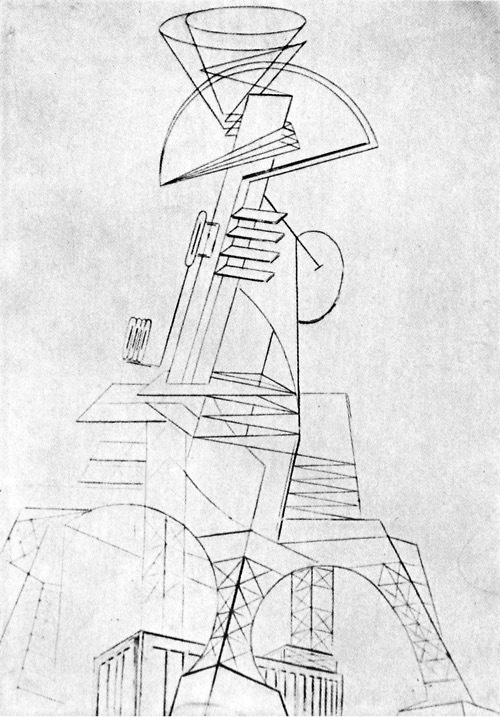 Vladimir Tatlin (with pipe) before a wooden model of his tower, St. Petersburg, 1920. But what now follows? Where has this great stream of sound come from, this inundation of the whole country in supernatural singing, in the sound of beating wings, this broad silver stream full of whistlings and clangor and marvelous mad bells surging from somewhere we are not, mingling with children’s voices singing and the sound of wings? Over the center of every town these voices pour down, a silver shower of sound. Amazing silver bells mixed with whistlings surge down from above. Are these perhaps the voices of heaven, spirits flying low over the farmhouse roof? No…. The Mussorgsky of the future is giving a coast-to-coast concert of his work, using the Radio apparatus to create a vast concert hall stretching from the Vladivostok to the Baltic, beneath the blue dome of the heavens. On this one evening he bewitches the people, sharing with them the communion of his soul, and on the following day he is only an ordinary mortal again. The artist has cast a spell over his land; he has given his country the singing of the sea and the whistling of the wind. The poorest house in the smallest town is filled with divine whistlings and the sweet delights of sound. Source: The King of Time: Selected Writings of the Russian Futurian, translated by Paul Schmidt (Cambridge, Mass. : Harvard University Press, 1985), 155-159.